I am almost afraid to write this review because you all are gonna eat all my cupcakes. The downtown in Daytona Beach has its fair share of eclectic boutiques, shops, and restaurants. Sweet Marleys fits into that groove but a little more. Its urbanite-y but not in a try hard kind of way (which sometimes this area overdoes greatly)...it has free wifi, a bunch of comfy couches and a great place to work or to hold a meeting. Its a true coffee shop vibe and I love it. The teas and coffee are excellent and they usually have homemade crocheted coozies which I could buy by the dozen. They are so cute! But I must say the cupcakes are not good...no no not good at all, don't eat them. COMPLETELY AND UTTERLY KIDDING...I just want them all to myself! 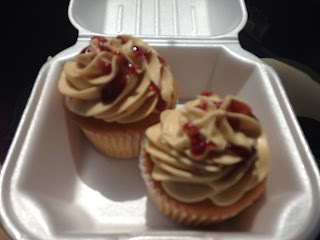 They are so delicious, and most of the time they are healthy and good for you too (as much as cupcakes can be) Below, is the peanut butter and jelly cupcake. 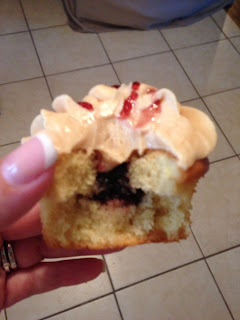 If the pictures are a little blurry, I think I was so anxious to take another bite, I was shaking. Like this? Share the love on Twitter!